I am University of Leeds student reading English Language and Literature. Are you tired of the hustle and bustle of Leeds? Ilkley, nestled in the Yorkshire dales, is a beautiful spa town characterised by its Victorian architecture and heather covered moors. Just a short journey from Leeds, the town is a perfect destination and escape from the hectic Leeds life. Soak up the stunning countryside by taking a walk through the moors, explore the town's heritage and historical buildings, or relax and enjoy a delightful lunch at Yorkshire's finest Betty's Tearooms. The town boasts a selection of independent shops, from book shops to vintage boutiques, which will no doubt tickle your fancy, so be prepared to do a little shopping on your visit. There are an abundance of pubs and restaurants within the town, from quaint little café's to Michelin star restaurants, like The Box Tree, so you can spend as much or as little as you want. If you fancy prolonging your visit then why not take a look at some of the varied accommodation Ilkley has to offer. Treat yourself and relax at one of Ilkley's finest spa hotels, or get back to nature and try camping with the kids. As you can see, the town caters for everyone's needs and price ranges. You cannot leave Ilkley without taking a walk upon the moors, it is a must do. The views are just spectacular and the walks are great for both the family and the romantic couple. 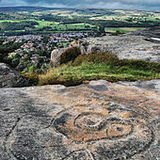 Ilkley Moors are not only famous for their beauty, but their architectural sites of rock carvings dating back to the Bronze Age. Explore Simon Armitage's Stanza Stones, a sequence of poems carved into rocks along a permanent trail from Marsden, Armitage's birth place, to Ilkley. The literary stones are a beautifully unique addition to the Yorkshire landscape. Travelling to Ilkley is simple. You can journey by car easy enough, but you can also go from Leeds train station to Ilkley station in approximately 27minutes. If you don't fancy going by train, you also have the option of the bus to Ilkley, which departs regularly from Leeds City Bus Station. More details can be found a www.wymetro.com. Ilkley is a beautiful tourist spot and as it's so conveniently close to Leeds there is no excuse but to visit and explore it for yourself. With so many attractions and activities to do, set a date, book your train and enjoy the beauty of the Yorkshire countryside. Why? To escape the hectic city life. Cost: Day trip travel by train costs approximately £5-8 return.